I read the article above last weekend about banks discouraging large deposits of cash from certain types of clients. Instead of paying interest, some banks are charging for holding cash in deposit. Perhaps you learned in school that banks take deposits and loan part of them out as part of their business. Apparently not in all cases. The regulatory environment is such that bank examiners want banks to hold collateral such as U.S. treasury notes against a large portion of cash deposits that could be withdrawn quickly. In other words, some types of cash deposits become liabilities for banks. Private sector assets backed by public sector debt! The current regulatory and zero-interest environment results in a variety of Bizarro stories like this one. Banks that charge interest for deposits while working not to lend money, and bank examiners explaining to bankers that they need collateral in the form of government debt (treasuries) to back up cash. Right. The blocking and tackling of economic growth and prosperity is really not that complex; work/produce, save and invest. These three activities, carried out by individuals free to make choices about what they do each day, result in individual successes (and failures) that sum to general economic growth. How is each of these three virtuous habits of free enterprise impacted by the current policy and regulatory environment in the U.S.? 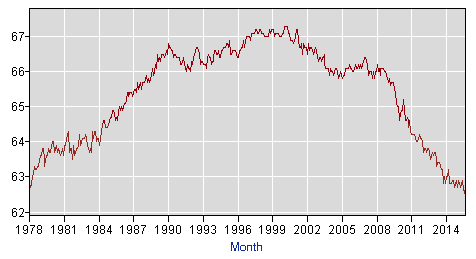 Work/produce – The U.S. labor force participation rate, the percentage of working age adults working or looking for work, steadily grew between the 1970s and the 1990s, reaching its peak of 67.3% in 2000. During the 2000s, and especially since the 2008/09 recession, the participation rate began to drop. Part of that drop was in response to the economic problems that started in 2008, and part of the drop comes from demographic factors like the aging of the US population and the retirement of the baby boomers. Nonetheless, the labor force participation rate reported by the Bureau of Labor Statistics last month was 62.4 percent, lower than January 1978. Incentives to work are reduced relative to historic norms. Marginal tax rates on high income individuals, those with significant economic wakes, have continued to creep up, for example. I had an Iowa State University (ISU) alumnus visit one of my classes last year. He had moved to Iowa for an exchange student year during his senior year of high school, attended and graduated from ISU, and eventually started what became a very successful trading and investing business. He explained to the students that in the 1980s, when he’d experienced his first financial success, he bit his lip each April and wrote the federal government a check for 28 percent of his annual income. As the years went on, however, that number continued to creep up. Around 2010 he wrote a check to government for taxes exceeding 50 percent of his income and decided it was enough. He had homes and offices in multiple countries and moved his residence to one with a 17 percent tax rate. There’s no reason to pity this very successful businessman as he will be fine financially no matter where he calls home. There is a reason, however, to pity the U.S. which lost at least part of the economic wake created by this extremely talented person. Incentives to employ are also reduced relative to historic norms in that It costs more to employ someone today than in the past. The Bureau of Labor Statistics reports that it costs private sector employers on average of 30.5 percent above salary costs for each employee. About one-third is for government-required contributions (social security, workers compensation) and close to another third health care. Health care expenditures continue to increase at a rate exceeding all other costs with Obamacare only exasperating that trend. In addition, Obamacare has created a whole new incentive for employers to employ only part-timers (otherwise healthcare benefits must be offered) and not to grow past 50 employees (otherwise healthcare benefits must be offered). 18.1 percent of U.S. workers report their employment as part-time, far above historic averages. 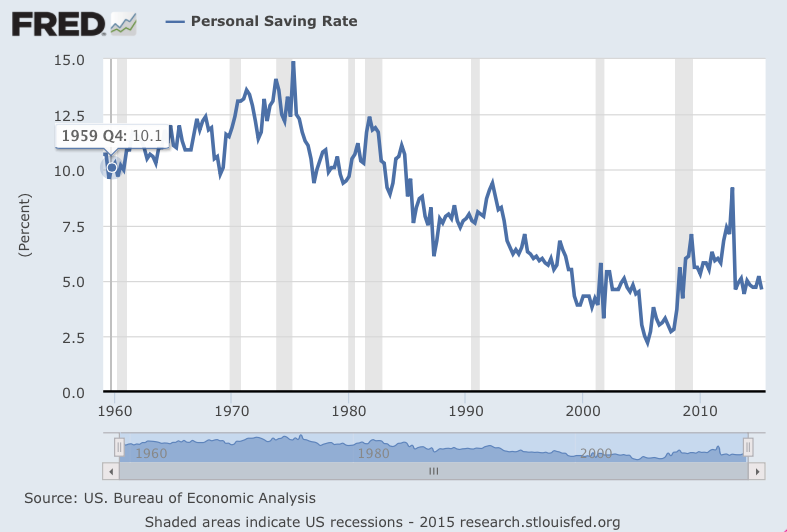 Save – The U.S. personal savings rate in September 2015 was 4.6 percent, part of a decreasing trend in savings rates since President Nixon removed the U.S. from the gold standard in the early 1970s. 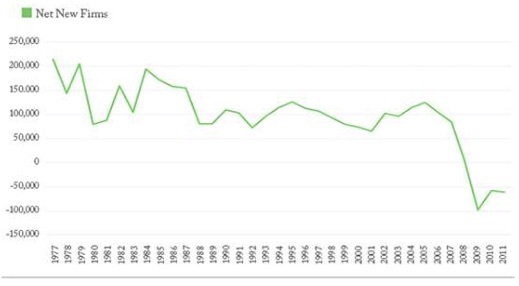 Saving rates averaged 5.5 percent in the 1990s, 8.6 percent in the 1980s, 9.6 percent in the 1970s, and above 10 percent before the 1970s. In the short run, higher personal savings reduces consumption, but over the longer run higher personal saving lead to stronger economic growth. The correlation between a country’s saving rate and its investment rate remains large and significant. Savings lead to investment which leads to entrepreneurial innovation. The idea of low interest rates is to increase spending and economic growth, but it severely punishes savers. Looking at rates at my own bank tells the story. Savings accounts rates of 0.01%, and certificate of deposit (CD) rates of 0.2% for 26 months, 0.3% for 39 months, and 0.4% for 58 months. Essentially zero return to the simplest and safest forms of saving money. Invest – Savings flow to investment. Investment is fundamentally about putting off consumption today for gaining bigger results later. It is the ultimate virtue of free enterprise. People put faith in the future in all kinds of forms. They put more into a savings or retirement account, for example, planning to access those funds in the future. In that process, however, they provide funds to entrepreneurs, businesses, and others that are building the elements of greater wealth that makes everyone better off. Investment can be measured in all kinds of ways, but the the greatest faith in the future comes when investment flows to new businesses. Individuals put their savings into launching a new business, transitioning from employee to small business owner and entrepreneur. Other individuals put their savings into the dreams of an entrepreneur they believe in, ‘angel’ investors in the language of the startup community. Finally, professional investors and funds or banks inject money into new businesses or new projects at established businesses that represent tomorrow’s way of doing things better than today. Investment activity that results in new businesses being created is difficult to measure because of its many sources, but the results are not. The U.S. Census Bureau reports that the total number of new business startups and business closures per year, the birth and death rates of American companies. These are employer businesses, those with one or more employees, the real engines of economic growth. Four hundred thousand new businesses are being born annually nationwide, while 470,000 per year are dying in the most recent data. Business startups outpaced business failures by about 100,000 per year until 2008. But in the past six years, that number reversed, and the net number of U.S. startups versus closures is minus 70,000. Economic growth that results in widespread wealth creation and prosperity will not return until this dynamic of free enterprise, new firm creation, is re-established. Current monetary and fiscal policies that throw a wrench in incentives to work, save and invest and channel limited resources away from private sector investment are destructive. When new businesses aren’t being born, growth stalls, jobs disappear and the dynamic of prosperity fades.